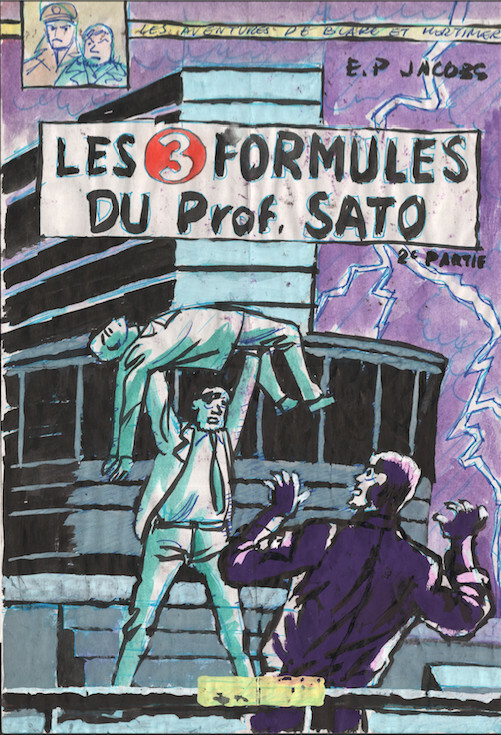 Late last year Dargaud published a Blake & Mortimer album holding the complete “Les Trois Formules Du Professeur Satô” series, in this case 2 albums of which the second album, “Professor Sató’s Three Formulae, Volume 2: Mortimer vs. Mortimer”, was drawn by Bob De Moor based on the sketches Edgar P. Jacobs made several years before. As we all know, up until today, people have mixed feelings about that second album, although when you are well informed you can only decide that Bob De Moor did exactly what Jacobs would have wanted. 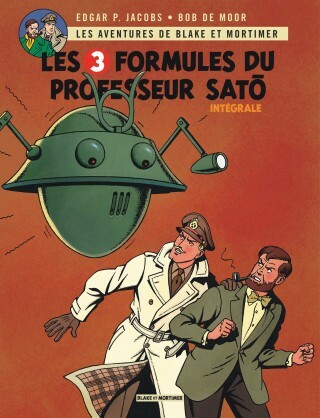 The Blake & Mortimer – Intégrales – tome 5 – 3 formules du Professeur Satô (Les) – Intégrale complète album is available now from Amazon France . But that is a complete other discussion and today we’ll focus on 2 drawings (sketches for the album cover artwork) which popped up in this new album edition. The origin of this drawing is not well known to the public, so here’s the story, and yes, this site was involved in discovering the sketchs and having them included in the album (hence why the names Olvier Marin and Bernard Van Isacker are also mentioned in the ‘thank you’). As we documented in the past, early last year we went to pay a visit to Olivier Marin, who many will know as artist behind the albums / series “Les déesses de la route”, “Le mystère de la traction 22”. 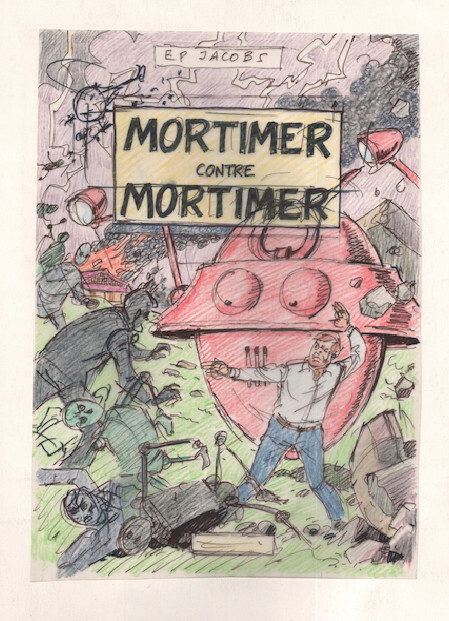 Olivier has a nice collection of originals of Bob De Moor, and that collection also includes a few Blake & Mortimer drawings, including 2 test drawings for the cover artwork, which hadn’t been published before. The first drawing shows a coloured sketch of the final version of the cover (and thus does not differ that much from the published version). You can see it below. 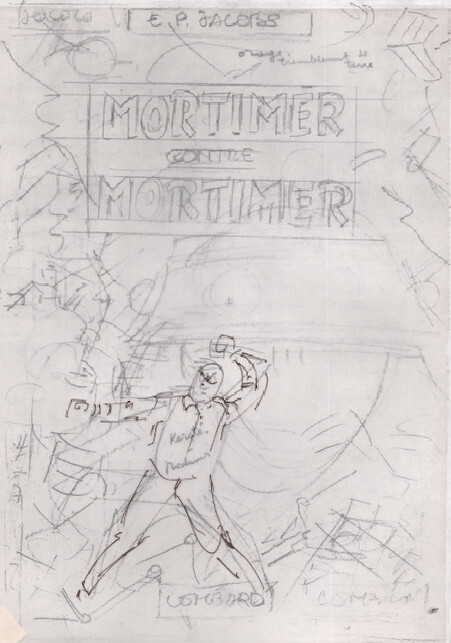 More interesting is the 2nd alternative version which consists of 2 parts, the underlaying drawing is as it seems a sketch by Edgar P. Jacobs on which Bob De Moor placed a film to construct a more finished version of the cover. We have no idea why De Moor (or the Edgar P. Jacobs right owners) went for a new version and not for this sketch, perhaps the composition was just not good enough. 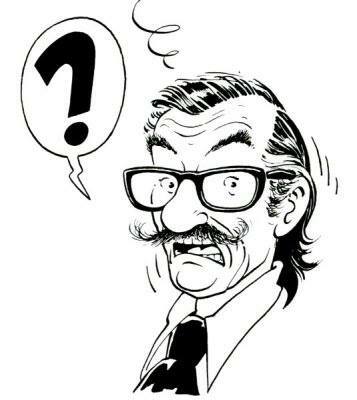 You can see the effect below, first you see the original sketch by Edgar P. Jacobs, and then the filter superposed by Bob De Moor adding his drawing to Jacobs’ sketch. As soon as I noticed these drawings I contacted the family De Moor and one thing led to another and they ended up in the new edition as exclusive new material. Or how coincidence can make things happen! Extended thanks to Olivier for his collaboration!